South African university soccer received a major boost on Monday, when the South African Football Association (SAFA) gave its blessing to the launch of the brand new Varsity Football Challenge. The inaugural edition of this competition kicked-off on campuses around the country on Monday, 22 July 2013 following the conclusion of discussions between the University Sports Company and SAFA. Varsity Football is the latest addition to the popular Varsity Sports initiative, organised by the University Sports Company (a conglomerate of South African universities) and its exclusive service provider, Advent Sport Entertainment and Marketing (ASEM). It follows the massive success earlier this year of Varsity Athletics and Varsity Hockey, and that of Varsity 7’s rugby and Varsity Beach Volleyball, which were launched in 2012. Also in the pipeline is the Varsity Netball series, to commence in September 2013. The new soccer competition will pit the country’s best male university teams against each other in a format designed to boost the sport at tertiary level and provide a breeding ground for exciting new soccer talent. Eight universities – the University of Witwatersrand (Wits), the North-West University (Mahikeng campus), Tshwane University of Technology (TUT), University of Pretoria (Tuks), University of the Western Cape (UWC), Nelson Mandela Metropolitan University (NMMU), University of the Free State (UFS) and the University of Cape Town (UCT) – will take each other on at different campuses on Monday nights, with two matches televised live on Supersport every week. After the conclusion of the round-robin phase, the top four teams will move on to semi-finals, with the winners contesting the final to determine the first Varsity Football champion a week later. “NMMU is privileged to be part of the new University Sport Company competitions and looks forward to NMMU Madibaz’ first match – an away game against UWC next Monday, says Dr Richard Stretch, Director of Sport at NMMU. ‘’Varsity Sports events are fast becoming an important part of student life where opportunities are provided to talented sport people, as well as for the rest of the students to identify with and support their team. NMMU is excited about the varsity Football competition and to exposing the student football players to a higher level of competition”. According to the NMMU Football Club manager, Mark Tommy, “Varsity Sport and in particular football is an exciting development within student sport and especially football. It supports the national objective of developing the game and creating opportunities for talented student footballer to compete at a higher level. This is so true for Port Elizabeth that does not have a professional soccer team. We are all excited that our students have this opportunity and hopefully Varsity Football will be the springboard for talented students who harbor professional football aspirations”. 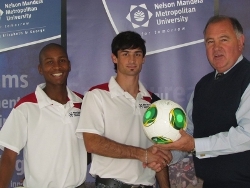 NMMU Madibaz Football captain, Kurt Duff is also extremely excited about this new opportunity and had the following words to share, “To the students, this is an opportunity for individuals like me and other talented footballers to compete at a higher level and be noticed – to be able to play at a higher level and achieve our dreams and goals. This competition provides us with a chance to challenge ourselves against more experienced players”. Varsity Football will initially only include male teams, but a separate challenge for women is in the pipeline, following the progression of the South African women’s student team to the semi-finals of the World Student Games in Russia last week.. Varsity Football is made possible thanks to the backing of Samsung (who is sponsoring a Varsity Sports event for the first time), First National Bank (FNB), Debonairs and Cell C.
IMAGE: NMMU Madibaz vice-captain Lundi Balfour captain Kurt Duffn and NMMU Sport director Dr Richard Stretch at the launch of the Varsity Football challenge.